A solar thermal hot water system can provide a supply of free hot water to use for domestic hot water, underfloor heating, space heating and the like, either in your home, business premises, or commercial environment. With the recent introduction of the Renewable Heat Incentive (RHI) it is now even more commercially viable and will significantly reduce your gas, electricity or oil bills, as well as earning you money. Yes, you now get paid for the energy you generate, even though you are using it all yourself, it’s just a win win win situation. We can design and install systems from 1.9kW upwards for use in a variety of situations either domestically or on commercial and institutional sites such as schools, sports clubs etc. It can be designed as an ‘on roof’ retrofit system, an ‘in roof’ integrated system, or even be on flat roof area or wall with a special supporting frame to help angle it directly towards the sun’s rays. There is some variation between systems, but essentially solar radiation from the sun directly heats a collector, which then heats a solar fluid (a non-toxic antifreeze water & glycol mix). This is circulated via a pipework system to a hot water storage cylinder or tank. Inside the hot water cylinder there is a heat exchanger which takes the heat from the circulating solar fluid and transfers it to your domestic water in a similar way that your gas or oil fired boiler heats your water. Note that the arrangements are not quite the same for a combi-boiler, because they heat your domestic hot water in a different way to a standard boiler with a hot water cylinder. Furthermore with underfloor and space heating the storage and heat transfer arrangements are slightly different. It might be useful for you, at some point, to explore the information available on various websites, where there are animations, schematic layouts and technical explanations of how the various systems work in more detail. On the Energy Saving Trust website, follow the links on generating your own energy, to solar thermal hot water for background information, a short film, an animation of how the systems work and good information leaflets to download. See also the various manufacturers websites below. 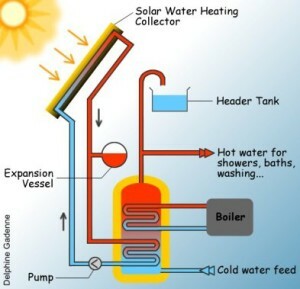 The components of a typical solar thermal system showing the twin coil hot water cylinder, the pumping station, the temperature differential control unit, the solar collector(s), the system pipework and the solar expansion vessel. Solar thermal collectors vary slightly according to the manufacturer in terms of the shape, size, outputs and efficiencies, but generically there are two main types: the evacuated tube or the flat plate collector. They work quite differently, although they can both produce the carbon free hot water that we need! It is generally accepted that evacuated tube collectors are slightly more efficient than flat plate collectors but in our opinion they do not look as good and tend to be more noticeable on a roof. 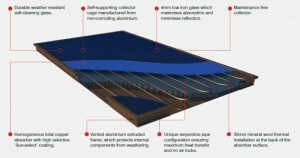 Flat plate collectors are of sandwich construction, composed of a thick layer of insulation at the bottom with the pipework circulating the solar fluid in the middle and a glass sheet that both traps the heat in and keeps the rain out on the top, all held together by a solid metal surround. These look very much like a roof-light when integrated into a roof structure when ‘built in’ or raised up slightly when ‘built on’ the roof, much like a velux in a loft for instance. Some of these commonly fitted flat plate collectors are made by companies such Grant, Kingspan, Schuco or Viessman. This cut-away image of a Grant manufactured flat plate collector shows the glass, the efficient heat absorbing layer, the pipework for circulating the solar fluid, the thermal insulation below and the metal edge frame. These products are manufactured under strict quality control conditions and are required to have MCS and or Solar Keymark accreditation in order to receive the RHI incentive payments from Ofgem. 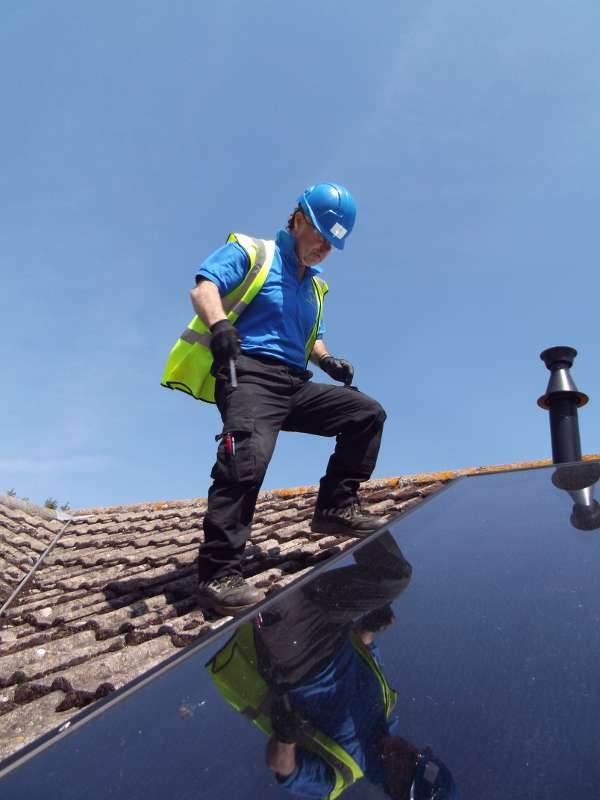 Look out for the Solar Keymark logo on all solar thermal products to ensure compliance with EU standards. Evacuated tube collectors look a bit like a series of long vacuum flasks in a row, all linked together at the top by a manifold, through which the anti-freeze solar fluid flows. Within this evacuated tube style of collector there is the wet type and the dry heat pipe type, the latter being the most commonly used. In the ‘wet’ type the solar fluid circulates up and down the glass tubes, similar to the flat plate collector, and collects it’s heat directly from the contact with the tube walls. In the ‘dry’ or ‘heat pipe’ type the solar fluid circulates in the manifold area only and the heat transfer occurs at the ends of the vacuum tubes via a smaller special contact area. The heat transfer along the length of the pipe works mainly by conduction through a very heat absorbing metal conductor strip. In both cases the evacuated glass tube surrounding the core which conducts the heat acts as a near perfect insulator due to the rarefied atmosphere within. The pictures below show the typical construction of a heat pipe evacuated tube Solar collector. These too vary according to the manufacturer so please go to the web-sites shown below if you would like further information. 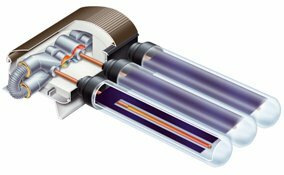 For example, see the Viessmann website, and follow the links to solar thermal evacuated tubes for details of their Vitosol 200-T series. This is a cut away section of a Viessmann manufactured ‘heat pipe’ evacuated tube system. 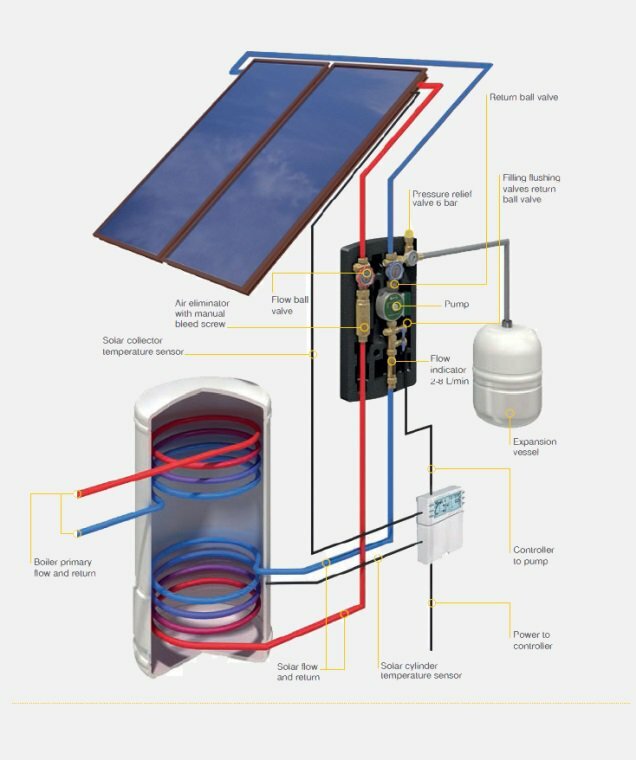 The picture shows the copper conductor in the centre and the blue coloured heat absorber surrounded by the evacuated glass tube and its connection into the manifold at the top where the Solar transfer fluid circulates. Also visit the Kingspan Solar website for details of their thermomax system and Grant UK Ltd for details of their solar thermal systems. These should provide a good overall indication of the types and quality of the systems we can install in your premises, be it domestic or commercial. 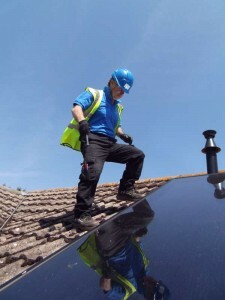 The correct design of a solar thermal system is essential to ensure that it meets your needs, reduces your energy consumption and more importantly your energy bills, but it’s also now vital that it maximises your payments from the RHI. During our site visit, where we will assess the relevant aspects of your building including the services elements, we will need to discuss with you the volume of hot water normally used and your normal building occupancy. These two factors mostly determine the volume of hot water storage required in the cylinder, and hence the required size of the solar collectors, but they are also used indirectly in Ofgem’s calculations to determine the payments you will receive from the RHI incentive scheme. The Thermal Solar Performance Energy calculations that we carry out during the design process, in accordance with MCS 024 incorporating the water volumes, gives a hot water energy contribution in kWh for your particular situation. This contribution figure in kWh is used, along with the particular RHI payment rate, to determine your annual payment figure that is paid to you on a quarterly basis. There are many situations where energy metering is specifically required, rather than using the MCS calculation basis, therefore it is vital that the Ofgem rules are studied in each instance to ensure the RHI payment process is applied correctly. Your solar thermal quotation, what you can expect! Following our survey and discussions the initial design works can be undertaken to determine the collector size, water storage / cylinder volumes etc you will receive a detailed quotation from us produced in accordance with the Renewable Energy Consumer Code (RECC). The RECC code is fully endorsed by trading standards, so you should have complete confidence that your interests are safeguarded. The price for the works, including a detailed schedule of the materials, labour and the activities that are included or excluded from the works, in accordance with the RECC code. Details of the design of the system and the estimated solar input to your hot water in kWh per year, all calculated in accordance with the current MCS standards documentation. You will be provided with all the technical data sheets for the solar collector(s), the mounting system, the differential temperature controller, the pumping station and cylinder all of which you can study and compare against your other quotes for quality and performance. A summary of the calculations showing the estimated earnings you are likely to receive from the RHI, in addition to the savings you can make on your energy bills. An estimate of the payback time based on the predicted earnings and the cost of the system. An schedule of payments, as suggested by the RECC code, so you can see that what you are paying is based on the value of works done or goods supplied for the installation.